The Etruscan cities of the dead, close to Rome, are like a mix of Celtic burial mounds, Egyptian temples, and the sunken churches of Lalibella. Relatively little is known about the Etruscsans, who were like the first succumbing tribe in a Mediterranean game of Catan. Their biggest failure being their living right next to the eventual Winners of the game, Rome. The origins of the Etruscans are unclear and their cities were eventually taken over by Celts and Italians. Some scholars suspect they might be descendants of the Sea Peoples, who attacked ancient Egypt and other regions of the Eastern Mediterranean, shortly before the rise of the Etruscans in modern day Italy. However, that only would put their origin story back by a few hundred years, as it’s not clear where the Sea Peoples themselves originated. Some think this might have been Central Europe, others the Eastern Mediterranean around Greece, though it’s the Greek term for the Etruscans that connects them to the Sea Peoples. 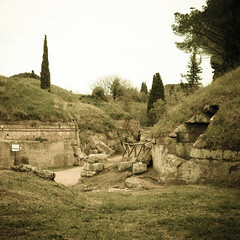 However, extensive research on the topic is inconclusive, connecting the Etruscans with a range of cultures from around the Mediterranean, with perhaps the most tantalising suggestive evidence being some of their artistic products containing swastikas, while it’s possible that Rome itself was actually founded by Etruscans, and seemingly was founded, if by Romulus and Remus, in the style of the Etruscans. But, Etruscan civilisation being wiped out early in history, little but a host of educated guesses remain. What does remain of this Etruscan past are a set of burial mounds, long hidden underground, some 40 km from the center of Rome. On gently sloping hills, they overlook the Tyrrhenian Sea, named after the Etruscans themselves, with a view that makes it easy to see the location’s appeal as an Elysian fields of sorts. The mounds were long covered; circular with doomed tops, still covered by grass, the walls have been dug out to create a moat around the constructions. 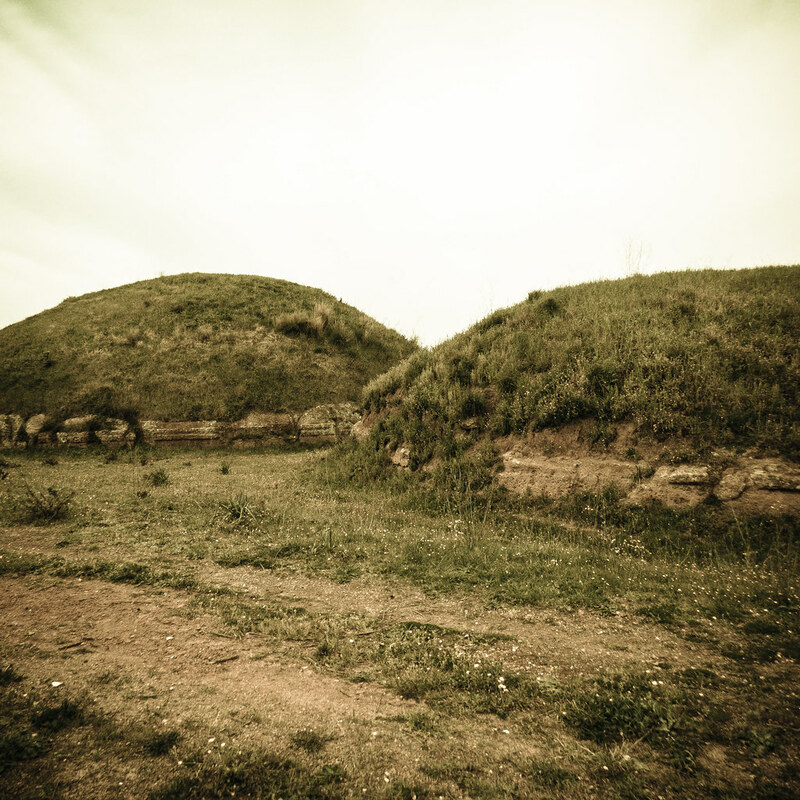 Of megalithic character, the burial mounds are now like Lalibella’s churches, though those were purposefully dug into the rock. The open air museum, with it’s many smaller constructions, packed close together, made me think of a clichéd African village, a collection of round little huts with roofs from straw. Except that these are all made from stones, each as heavy as a grown man. 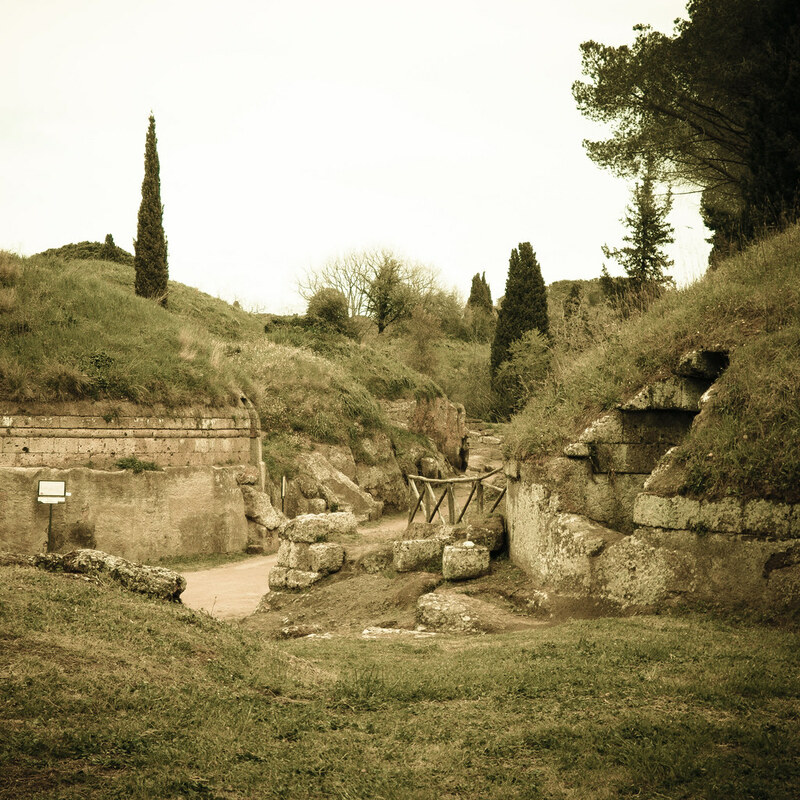 The two burial sites outside Rome are fascinating, but don’t get the attention they deserve. Are the Romans begrudgingly accepting the presence of a second ancient civilization on their doorstep? Either way, with museums typically closed on Mondays, but last Monday them having opened their doors for Easter Monday, the replacement holiday was the day I visited. As public transport buses only make the journey about once every two hours, this was an unwelcome surprise.